I have set up the third and final (for a while at least) of the sites devoted to geographical and chronological mapping of historical conflicts. Not that I need an additional time sink but the compulsion to add an American Civil War Project was irresistible. Populating a quality data set is the fundamental reason that I started the project. Eating my own dog food is a great way to find problems with the UI. Implementing this feature involved a bit of learning curve to understand how the MooTools Request object worked, but in the end it was pretty straight forward. I need to a better job of filtering datapoints in the page. Rather than doing a reload from the right hand tag menu. I need to scroll the timeline to a data point based on the id. I would like the ability to flag data points as offensive,inaccurate. I would like the entry page for each data point to reflect the number of flags. I would like to create user badges/achievements based on what the user does in the system. This inspired by the X-Box achievements system via StackOverflow. I realised today that it would be handy to do a GeoCoding request based on a city name typed into the edit/create entry forms. I often found myself doing a search on wikipedia, going to the geocoding page and then copy/pasting the latitude, longitude. This could mostly be automated in the form. I have clarified the tags for each data point, but they are still not perfect. I need to remove the theater option for The Napoleonic Wars. I also should get rid of the War, it is not really useful. I need to clean up the info window dialogs on the map. They are ugly at the moment and they need links to the edit page and discuss page. Check out the details for licensing the data as CC WIKI. What was the motivation for the site? Where do I signup to contribute? While digging around in my attic some time late last year, I discovered a fold out Timeline of World War Two that had been a birthday present some years ago. It inspired me to investigate if this sort of information, in this format, was available on the Internet. I discovered that although there is a wealth of websites describing lists of events in great detail (Wikipedia being the most impressive), this particular presentation of the information (a scrolling timeline of events) was either not available or buried so deep in Google that I didn't uncover it. What I did discover was an amazing programming tool which marries a scrolling dynamic Timeline (almost exactly what I had envisaged) with a Google map. The addition of geographic information to my original concept of a Timeline sealed my fate. Mapping historical events in time and space has become my new obsession. Where do I sign up to contribute? You can now sign up for an account and start entering data. Because of the limited space available for each map point, I wanted to provide the ability to link to a more expansive explanation for the data point. Wikipedia provides, in my opinion, the best collection of articles, maps and documents to describe the data that will be added to the Timeline system. I have mandated the inclusion of a Wikipedia link to ensure that users will always have an easily accessible link to more information if they require it. Land - Any combat that involves land based forces (infantry, cavalry, artillary, armour etc...) should include this tag. Naval - Any combat that involves naval units should include this tag. Aerial - Any combat that involves planes should include this tag. Airborne - Any combat that involves airborn troops (paratroopers), should include this tag. Domestic - Any event that is purely concerned with the internal infrastructure of a particular country should include this tag. Diplomacy - Any event that involves some kind of negotiation between two or more nations should include this tag. International - Any event of significance to many nations should include this tag. You will notice that you can apply more than one tag to a data point and you should include any and all tags that are applicable to the data you are adding to the system. 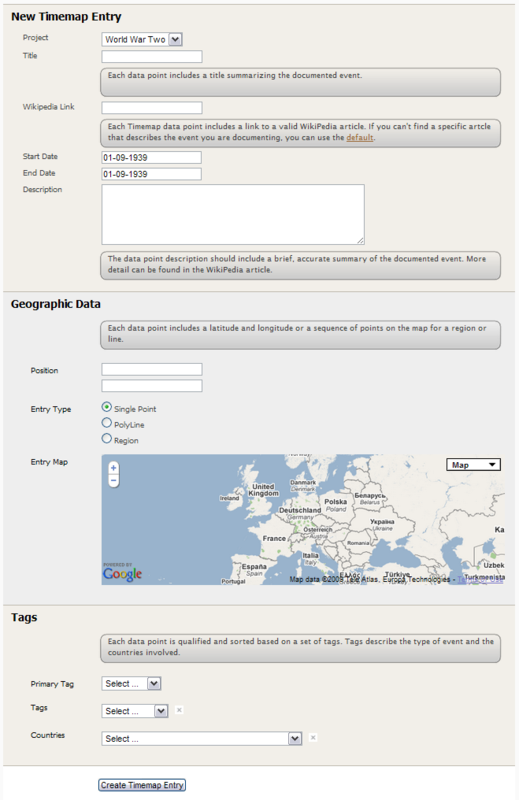 The first tag is a special tag that is used to color the entry on the map. You should use the most significant tag first. I still have a list of features that I would like to implement and the project is still very much in BETA. I would appreciate any suggestions or corrections you might have. You can email me at .